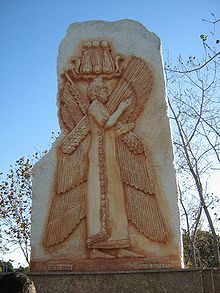 Hi Cyrus nga Harangdon (iningles: Cyrus the Great) (c. 600 BC o 576 – December 530 BC), amo an syahan nga Zoroastiyano Persyano nga Shāhanshāh o emperador. Hiya an nagtukod han Imperyo Persyano ha ilarom han dinastiya Achaemenid. ↑ Ghasemi, Shapour. "The Cyrus the Great Cylinder". Iran Chamber Society. Ginkuhà 2009-02-22. Cardascia, G (1988). "Babylon under Achaemenids". Encyclopaedia Iranica. Vol. 3. London: Routledge. ISBN 0-939214-78-4. http://www.iranicaonline.org/articles/babylon-under-the-achaemenids. Fried, Lisbeth S. (2002). "Cyrus the Messiah? The Historical Background to Isaiah 45:1". Harvard Theological Review 95 (4). doi:10.1017/S0017816002000251. Schmitt, Rüdiger (1983). "Achaemenid dynasty". Encyclopaedia Iranica. vol. 3. London: Routledge. http://www.iranicaonline.org/articles/achaemenid-dynasty. Schmitt, Rüdiger; Shahbazi, A. Shapur; Dandamayev, Muhammad A.; Zournatzi, Antigoni (1993). "Cyrus". Encyclopaedia Iranica. Vol. 6. London: Routledge. ISBN 0-939214-78-4. http://www.iranicaonline.org/articles/cyrus-index. Settipani, Christian (1991) (ha French). Nos ancêtres de l'antiquité. Paris: Editions Christian. Bickermann, Elias J. (September 1946). "The Edict of Cyrus in Ezra 1". JournaI of Biblical Literature 65 (3): 249–275. doi:10.2307/3262665. Drews, Robert (October 1974). "Sargon, Cyrus, and Mesopotamian Folk History". Journal of Near Eastern Studies 33 (4): 387–393. doi:10.1086/372377. Harmatta, J. (1971). "The Rise of the Old Persian Empire: Cyrus the Grea". Acta Antiquo 19: 3–15. Mallowan, Max (1972). "Cyrus the Great (558-529 BC)". Iran 10: 1–17. doi:10.2307/4300460. Jovy, Alexander (2012). I am Cyrus: The story if the real Prince of Persia. Reading: Garnet Publishing. ISBN 978-1-85964-281-8. Ini nga pakli kataposan nga ginliwat dida han 00:49, 25 Enero 2015.